Eliminate destructive speaker backwave energy with Deflex. 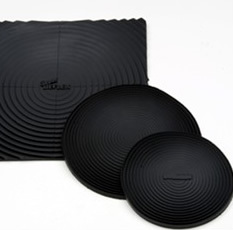 Deflex PowerPads Pads are waterproof speaker backwave damping pads, specially designed to prevent speaker cone break-up due to standing waves and enclosure resonance. This allows higher sound volumes with a minimum of distortion. Deflex Power Pads are made of an advanced polymer on the verge of becoming a liquid. The material, being an excellent shock absorber combined with a spherical, concave surface eliminates enclosure standing waves. Basically the material deflects and fragments the speaker back wave instead of converting it to heat like Dacron or fiberglass. The result is high output with greatly minimized cone distortion and break-up. The audible benefit is greater control and increased detail. The Deflex Power Pads are ideally suited behind any mid range to low frequency speaker. They replace existing fiberfill or foam absorbers. Enclosures that are shallow and have a rear wall that is parallel to the speaker benefit the most from a power pad application. This also includes in-wall speaker applications. Vehicle doors are also ideally suited for treatment, especially since foams or fiberfill can not be used due to water exposure. 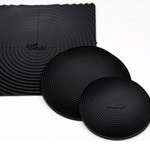 Deflex Power Pads need to be roughly the same diameter or larger than the speaker cone. The Deflex Powerpad should be centered directly behind the speaker for maximum performance.